Word travels fast in Nantucket when two children and their dog discover a skeleton in the dunes of the cold Sconset beach. Could the dead woman be the latest victim of the serial killer who has been terrorizing mainland Massachusetts? The FBI seems to think so and sends their forensic psychiatrist to the scene. 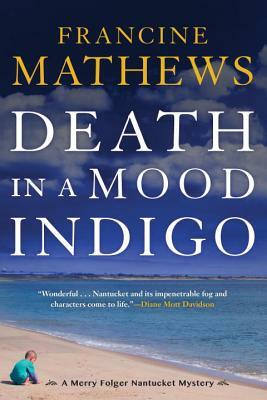 But Police Detective Merry Folger has her own suspicions, and starts looking into a cold case that has long baffled Nantucket police: the disappearance of a beautiful Harvard-educated psychiatrist seven years ago. When Merry starts inquiring into the tenuous leads in that long-cold case, she stumbles into a web of violent passions and buried crimes, a web that continues to ensnare victims. Two more women are murdered, giving fuel to the FBI’s quest for a serial killer. But Merry, well-aware of the tangled histories of some of the island’s longtime residents, is convinced the only way forward is digging deeper into the past. Francine Mathews was born in Binghamton, New York, the last of six girls. She attended Princeton and Stanford Universities, where she studied history, before going on to work as an intelligence analyst at the CIA. She wrote her first book in 1992 and left the Agency a year later. Since then, she has written twenty-five books, including four other novels in the Merry Folger series (Death in the Off-Season, Death in Rough Water, Death in a Cold Hard Light, and Death in Nantucket) as well as the nationally bestselling Being a Jane Austen mystery series, which she writes under the penname Stephanie Barron. She lives and works in Denver, Colorado.